It is commonly believed that the Somali cat is directly descended from the Sacred Cat of Egypt, however, this is not so. The Somali is a long-haired cross between an Abyssinian and a Birman cat. Abyssinians sometimes produced fuzzy, long-haired kittens with bottle-brush tails. 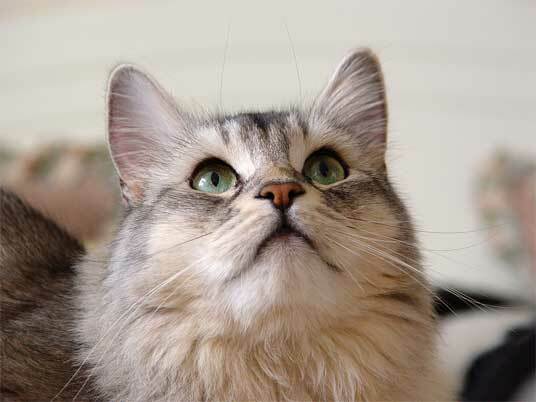 In the 1940s, breeder Jean Robertson exported Abyssinians to North America and Australia and subsequently in 1963, a longhaired descendant was shown in a Canadian cat show. The judge was so impressed that he asked for one to breed from, and resulted in teh first official Somali. 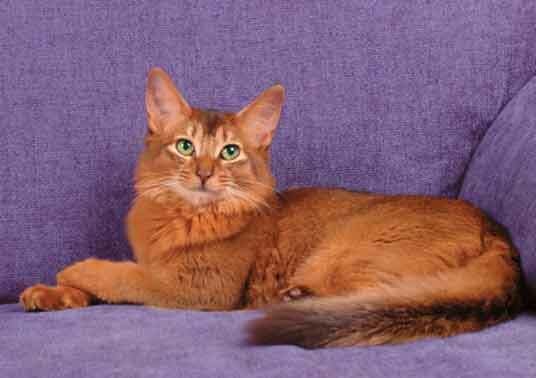 At the same time in the USA, breeder Mary Mague was also developing longhaired Abyssinians that she called Somalis. Canadian breeders eventually combined their breeding stock with her and the breed was accepted by North American registeries in the late 1970s and appeared in Europe in the 1980s. Somalis have a characteristic long ruddy coat and bushy tail. Their coats are ticked (alternating light and dark bands on each strand of fur) and have a black stripe down their backs. They have large ears, and a full ruff around the neck and upper legs. They usually white fur on their muzzles and throats, and some Somalis have tabby markings, including the characteristic "M" on the forehead. During the warmer months they can appear almost short-haired due to substantial shedding. There are 28 coat colours for Somalis, but the ones that are most recognised are ruddy silver, red silver, blue silver and fawn silver. Somalis have lithe, muscular bodies and long legs. Somalis are alert and lively cats that need lots of room to move. They do not enjoy an indoor-only lifestyle unless kept indoors from birth. They are outgoing animals that live easily with other cats.